At Walmart President Obama announced solar panels on the roof of the White House. 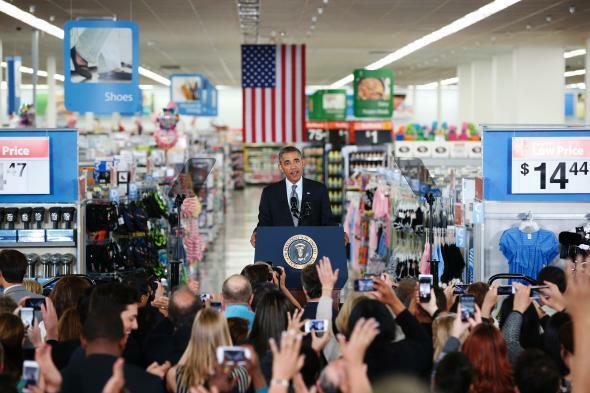 Obama talks about solar energy in a California Walmart, on May 9, 2014. In 1979 Jimmy Carter had solar panels installed on the White House roof. Then Ronald Reagan got rid of them in 1986. But now, 35 years since they were first installed, they’re back! Don’t strain yourself, White House. The Obama administration started working toward the solar panel installation in 2010. But a year later, people were wondering where they were. And not even headlines like “What Ever Happened to Those White House Solar Panels?” could speed the process. In 2013 the White House confirmed to the Washington Post that installation had actually, physically begun. Today (it’s 2014 just in case anyone is counting) the White House announced that it has completed the job. The size of the array that we established here is the typical size for the average American house. Being at the White House, we do have some security concerns. We can’t cover the entire roof with panels, although that would be good from an energy-saving standpoint. Meanwhile, at a Walmart in Mountain View, California, President Obama talked about how important solar energy is, and Walmart announced that it will double the number of Walmart and Sam’s Club roofs that have solar arrays by 2020. This fits into a larger Walmart goal of generating (or “procuring”) 7 billion kWh of renewable energy by 2020. That’s 35-year-old tech in action.